Spring cards with brand new stamps and dies from Doodlebug! Happy Happy Friday! I'm doing a little happy dance in my studio! (I can't dance outside because, um, it's freaking raining again!) Oh Lord! I am waiting for my husband to get home from work so we can go and celebrate his well deserved promotion he received at work this week. Praise the LORD! I am so proud of him and so excited for him to achieve this goal he's been working towards. He is a good man and he works so so hard. This is a good day. We're going out for some Italian food and probably a drink or two. YEAH!! Okay, back to crafting! The other day I received a big ole box of happy from Doodlebug Designs! YIPPEEE! Long one of my very favorite companies. I adore their sweet style and cute images. They always make me smile. (And I totally collect their awesome pins too!) I received this box because Doodlebug recently revamped their clear stamps products and now they have matching dies for all their stamp sets too! I made some projects yesterday and can't wait to share them with you. So cute for Spring and Easter. Lots of bright color and just down right cuteness. For my review of the stamps - they stamp nicely, straight out of the package. No bare spots or ink blotching. A+ in that regard. When I went to open the dies, much to my excitement, I found out that they are pre cut! AWESOME! You don't have to cut them apart with your snippers! I love that some companies are starting to do this now. It's such a nice touch. So, I definitely recommend the Doodlebug stamps/dies.... And you guys know I'm addicted to their shape Sprinkles already. But we won't go there today. First up is a bright and colorful Easter Card! The finished card is A2 size with a white card base. I layered a strip of that gorgeous plaid paper on the right side, and then layered more white on top of that piece. Next I stamped and die cut out all those adorable shapes, and colored them with Copic Markers! I used colors to match the patterned paper so it all goes together. The sentiment was stamped and die cut out with a banner from my stash. I added some flowers and leaves to complete the banner edge! I die cut a stitched circle out of white and then a larger stitched circle using the grass patterned paper. Then I layered on my bunny, lamb and Easter basket! SO SWEET! I added a few more of the shape sprinkles tiny flowers. Here are some of my supplies! Next up is a cheerful all occasion card sure to make someone smile!! The card is an A2 white card base. I layered beautiful golden yellow floral paper to make my bottom layer. I die cut a stitched rectangle from Neenah cardstock. I used the Polka Party Stencil from Taylored Expressions to make a dots background. I faded out the color from the bottom right up to the top left. Just thought it looked happy!! The 'grass' layer is part of a scalloped rectangle die cut, cut to fit. I used Twisted Citron Distress Ink to color it a bright green. I stamped and die cut out the bee, the sun and the little girl and colored them with Copic Markers. Isn't she sweet!? Sending you Sunshine!! 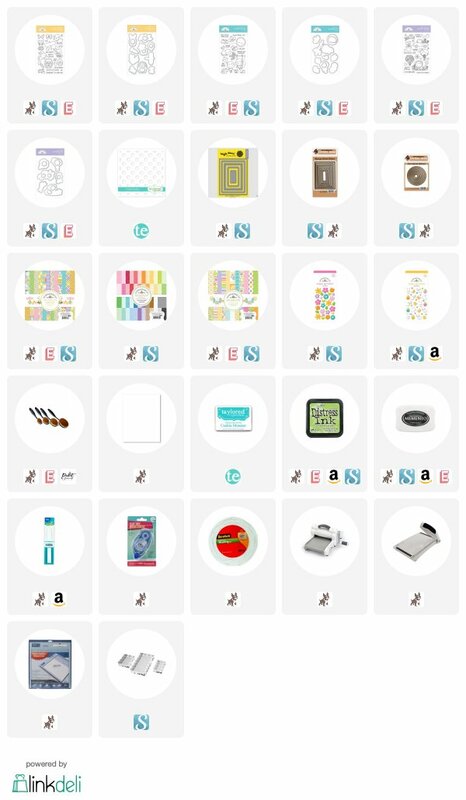 All Doodlebug is on sale right now at Scrapbook.com! Woot! CLICK HERE to see what's new! EVEN the pins are on sale! And, again, THANK YOU SO MUCH for your support of my Amazon Storefront! I appreciate it so much! So Cute! Congrats to your Husband! Congrats to Mark on his promotion. Hope you had a fun celebration! Love your wonderful cards. I love Doodlebug also and I'm excited to hear that they have stamps and dies now. Can't wait to add them to my collection. Thanks for sharing your adorable cards. Oh my Doodle Bug goodness! I had read that they were doing stamps/dies and am so glad you did this wonderful preview. Your cards are so cute. I have started my Easter cards just yesterday. So glad to be using bright and Springy colors. Congrats to Mark on his promotion! I hope you guys have a sweet celebration together....and thank you for the tip on Scrapbook.com's sale. These cards are too cute! I love Doodlebug and glad to see they're back to releasing super cute stamps!